Learning philosophy……at the feet of the masters. I am no philosopher. But since I took up blogging nearly a year ago, I have enjoyed the company of many bloggers who are. Bloggers who are innately philosophical and provide homespun, humorous schools of thought of great variety. I am constantly amazed at the writing talents of so many of you. Your witty, perceptive and often droll messages leave me laughing, pondering, and in more cases than not, feeling inadequate. When I took up blogging I felt that I had some natural writing ability that would see me through. I soon learned it takes much more. Some of you reveal more insight in a comment than I do in an entire blog. I feel like a rookie waiting for that call up to the big leagues. You have shown me that good writing is about experience. And writing from experience. When I started it was mostly opinion. Now it is mostly feeling and recollection. You taught me that. As I put it to one blogger, I feel like I have mentors and friends that I haven’t even met. It’s been fun getting to know you. Learning about the funny things that have happened in your life, and in a few instances, sharing the sadness of your disappointments and difficulties. Thanks for letting me join your elite group. 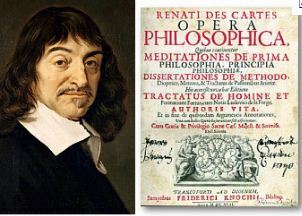 This entry was posted in Misc and tagged Blog, Philosophy, René Descartes. Bookmark the permalink. 20 Responses to Learning philosophy……at the feet of the masters. I’ve been blogging for well over a year and still feel exactly the same way! This post fit me to a tee. Thanks for the insight. Glad you enjoyed it Jodi and thanks for visiting. Just got back from a trip but look forward to reading your blog, too. This post is spot-on. Like you, I am constantly amazed at the talent to be found on the blogosphere. How I’m getting better with practice. And how necessary this writing has become to me. But the biggest surprise has been how close I’ve come to feel to people who are, in essence, strangers. Couldn’t agree more pegoleg. This is an addiction. I feel like I should get up at a meeting and say “My name is Al and I’m a blogger.” Oh what the hell, pass me another blogroll! Why read a book when you can read post from one of the world’s most intelligent people. Oh wait, that’s wrong. We settled that didn’t we? I knew I would regret that post! From what I’ve seen, Al, you’re in with the best of them. You are witty and wise–what more could a blogger be? I forgot: you’re also prolific and humble and ready with wonderful comments for other bloggers. Good show, my friend! Thanks Lorna. I have made contact with other bloggers through comments made on your blog site. You have many, many readers and for good reason. It’s a neat little community of like-minded folks for which I am grateful. Right you are again, Batgirl. I promise the next blog will not be so serious, but just wanted to get that out there. As for the flattery, did I mention you look stunning today? Very impressed with your blogger friends, Big Al, as I always am with you. I’ve always felt you had writing style. Thank you Bernice. You are certainly not a “new” friend but rather one of the first ever friends in my life. I appreciate your support. My blog seems to be gaining some steam and someday maybe I won’t be “little read writing Hood” any longer. Many thanks to one of the new friends and “mentors” I spoke about. If you feel inadequate, this may well be because you compare the real you to the texts of others—not to the others, themselves. Spoken like the true philosopher I suspect you are. To clarify, I meant that it was the writing and relating of the life experience that I felt lacking in, versus the the experience itself. I understand that just as there are no two lives lived alike, neither is there just one good way to write about it. As I think more about it, I guess it’s all in the eye of the beholder, or in this case, the comprehension of the reader. Thanks for the comment and visiting my blog.